An expert in his field, Jerry Arnold provides invaluable lessons learned from decades of trial and error as a die maker, die designer, and die engineer. Written in an easy-to-read manner and heavily illustrated, Die Makers Handbook is the only book of its kind expressly intended to help avoid the pitfalls associated with stamping designs, die designs, and stamping die function. This compact and practical reference has been edited by a half-dozen die makers with nearly 200 years of combined experience. 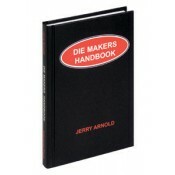 The Die Makers Handbook is a must-have for your toolbox, desk, or briefcase. • Developed from more than 30 years of practical shop-learned information. • Chock full of all the stamping design pitfalls you don't need. • Includes a full chapter on exotic measuring methods, providing unique aids and hard-to-find-data. • Devotes an entire chapter of illustrated step-by-step process for designing progressive dies. • Especially designed for apprentices, young journeymen, and students of die design.